I know sometimes when I read blogs I start to think that everyone else has it together. Their houses are clean and organized, and their kids are fed the most nutritious meals. Anyway, I used to let myself get caught in that feeling, but I don’t go there any more. I know that when I write my blog posts, I typically put my best foot forward. I am always trying to see the bright side, so why dwell on the less than positive parts of life by writing them down in my blog. I know others do the same. So today, I thought I would how you a few areas in my house right now. Someone asked me this weekend how I do it all? I seem to have it together. Ha, I just look like I am juggling with easy. The truth is I am good at getting things done. I prioritize my things to do and many times I let a lot of crap fall off my plate. I guess when my friend comes to my house, it is always organized and clean. Ha, my house is rarely organized and clean. It is one of the things I usually let slide, or my boys clean. The only time the house gets cleaned and things put away is when I know someone is coming over. It is my reason to clean, otherwise everything else comes first. Now don’t get me wrong, I love it when people come to visit unannounced, they will find me in my crazy, messy life that I love. No excuses…hopefully they came to visit me not my house. But a house needs to be cleaned occasionally so having visitors gives me the motivation to do it. So without further ado, here is what you would find on my main floor if you dropped by today. The picture above is my entry way. Those are purchases from the last three weeks that I am trying to clean, sort through, log in, take photos of and list on Etsy. That is the first thing that would greet you. 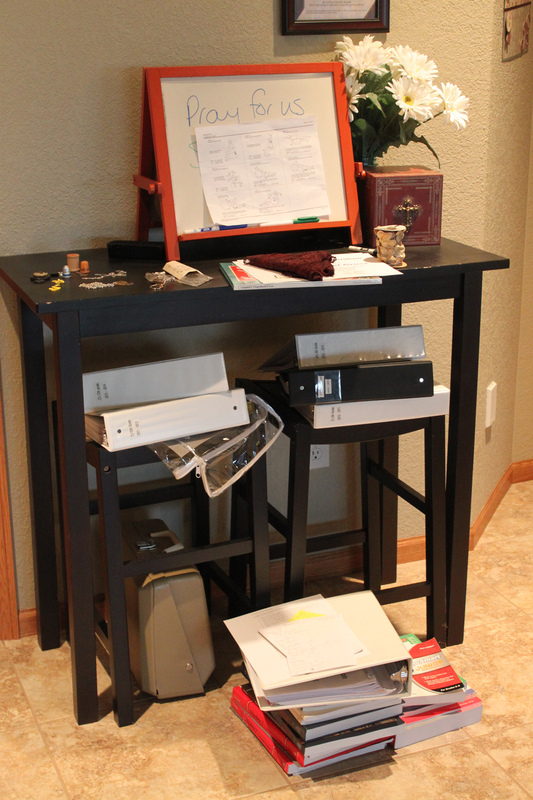 Then there is the homeschool pile. I am trying to finalize this year and plan for next year. Basically done with JV, but am struggling to plan for Z for next year, his senior year. He wants to take a class or two at the local high school again, but they won’t have the schedule done till early June. So it sits and waits. Then there is this table. JV and I decided to work on our stamp collections this summer. 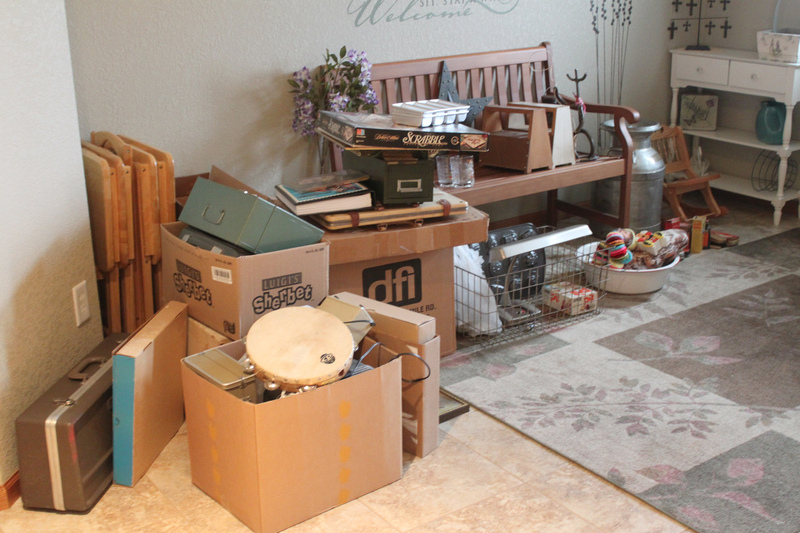 We store it in the guest room closet, so we pulled everything out of the closet. (Perfect time to clean that closet.) We are going to put things away and organize our stamps. Easier to do when you pull it out. We did this last Friday and haven’t gotten back to it yet. 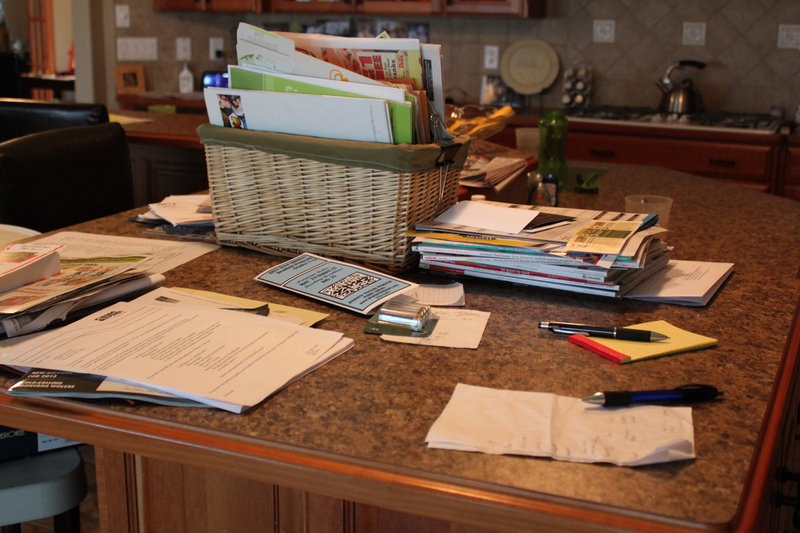 This is the pile of papers on my counter. I struggle controlling paper, and this is my frustration zone in my house. Try as I might, it is always messy here. Normally it gets put away when we entertain, but then it grows back almost over night. JV is fixing a wolf puzzle, so that is in the living room right now. 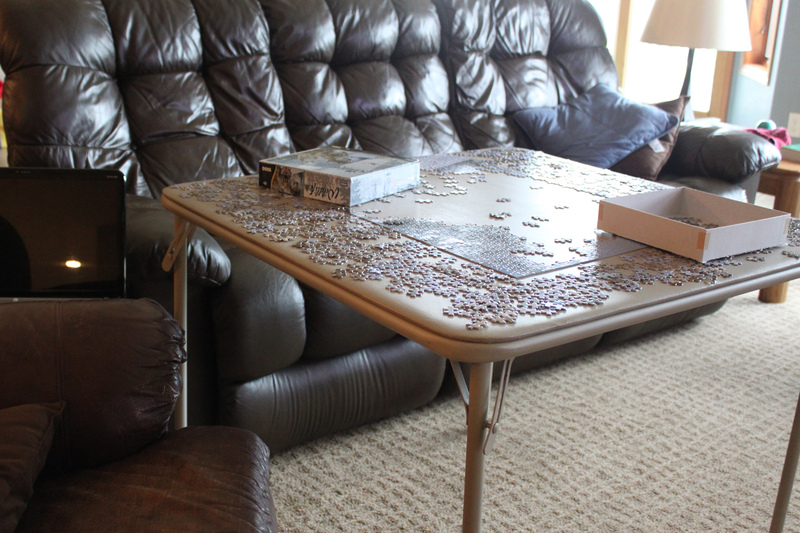 I love fixing puzzles. I used to fix them during the winter on Sunday afternoons watching the Dallas Cowboys with my Dad. 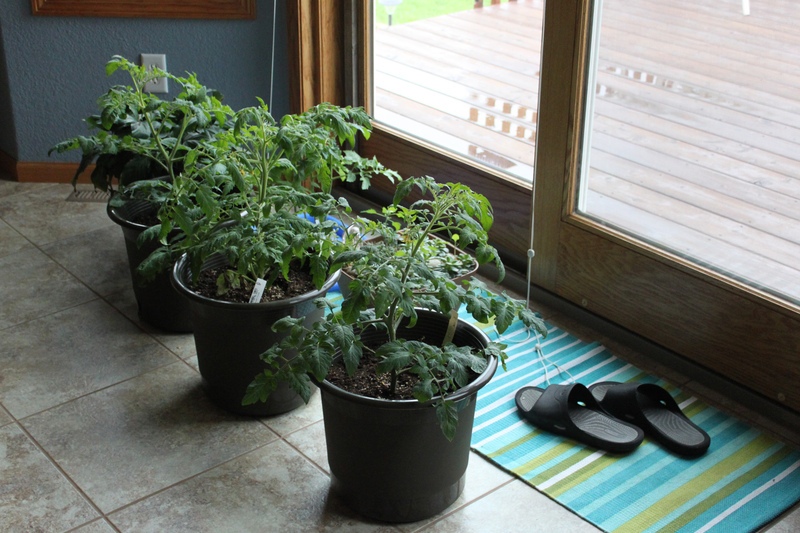 Our tomatoes were pulled into the house because of the rain. Bismarck averages 2.25 inches of rain in May, the second highest month of the year. It started raining Thursday. We are up to 3.75 inches, and it isn’t done yet. There are a few other small piles of things as well, but you get the idea. Life is crazy, messy. Things get thrown all over the place. I don’t believe it should be clean, organized and perfect. We still have to live life. Life is good. Find a way to embrace your crazy, busy, hectic, messy life. I know I, for one, won’t wish I had a straighter, organized home when my boys are gone. 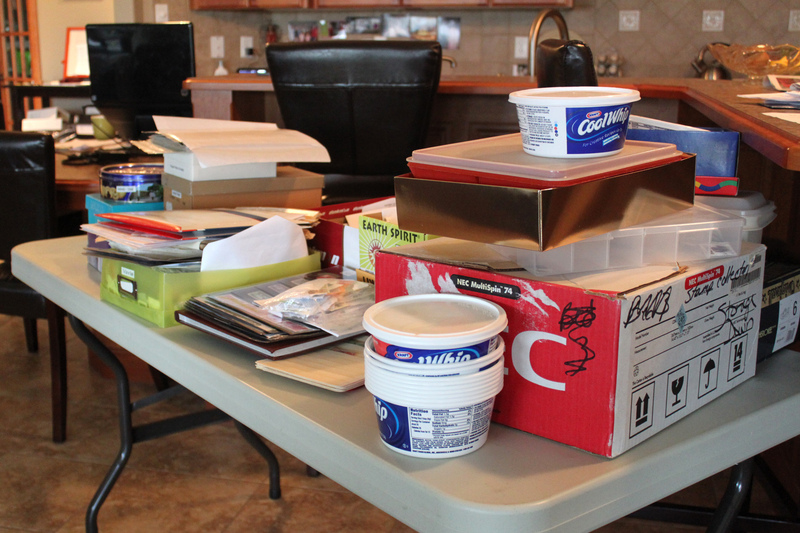 I call those piles – staging areas!! Thank you, it was a little hard to post the pictures, but it really is my life, so I wanted to share. I never want my guests to feel like they can’t drop it, but I really do need reasons to organize and clean and having people over is one of them. Glad I am not the only one.